This is one of my favourite holiday projects of all time. 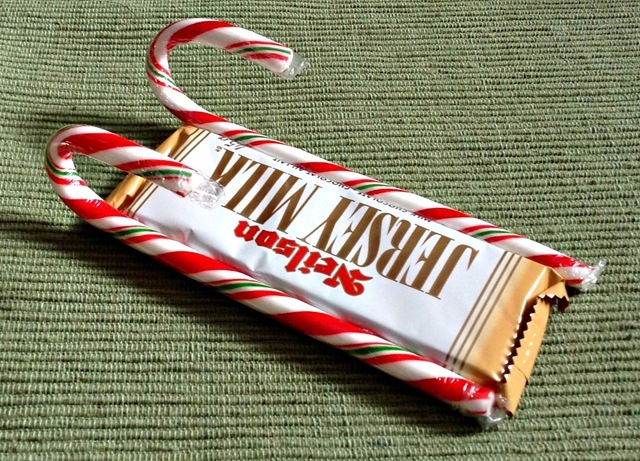 I used to make these on a smaller scale (small candy bars and candy canes and then a few wrapped candies instead of the stack of chocolate bars) as a Christmas gift for my students when I was a teacher. When I taught older kids, we made them together and they took some home for family and friends and we’d even make some to donate to the women’s shelter in town for the kids living there over the holidays. 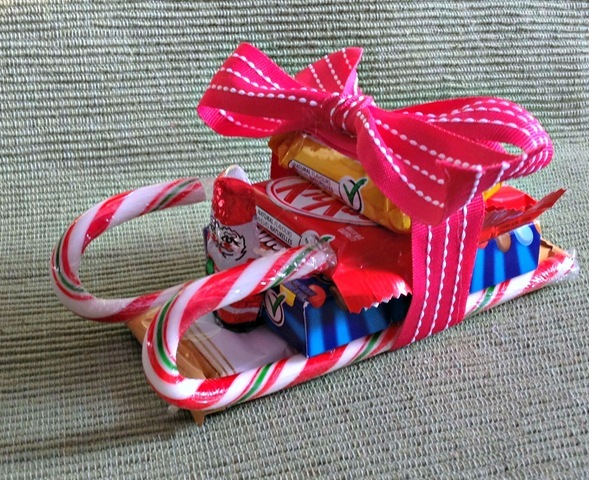 These Christmas candy sleds make fantastic gifts for friends, neighbours, and co-workers and are great as table favours for your holiday celebrations. Since this is a Craft Lightning craft, they can be made in under 15 minutes. Once you’ve made one or two, you’ll probably find you can make them in 5 minutes flat! This is not only a quick project but it’s really simple to put together too! (Hence why I used it for my students because it’s one that’s great for making up in large batches). 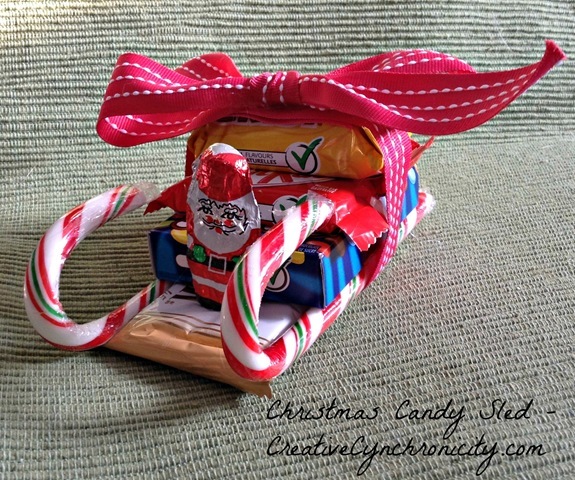 To get started put some glue on each side of the regular size candy bar and glue on the candy canes. Next glue on some of your smaller chocolate bars. 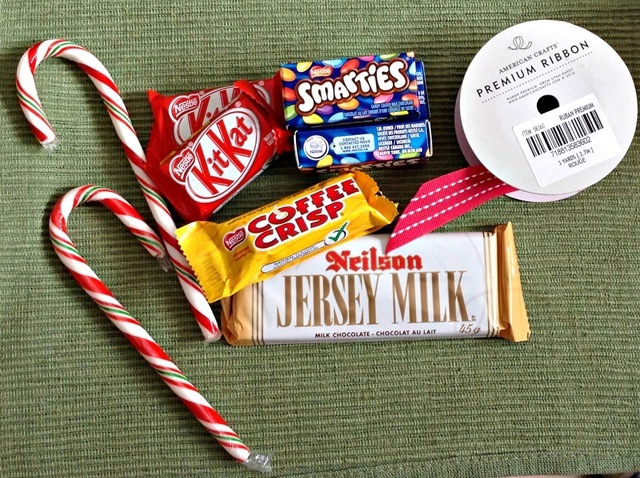 I used three boxes of Smarties – for you Americans, our Smarties are like your M & Ms. 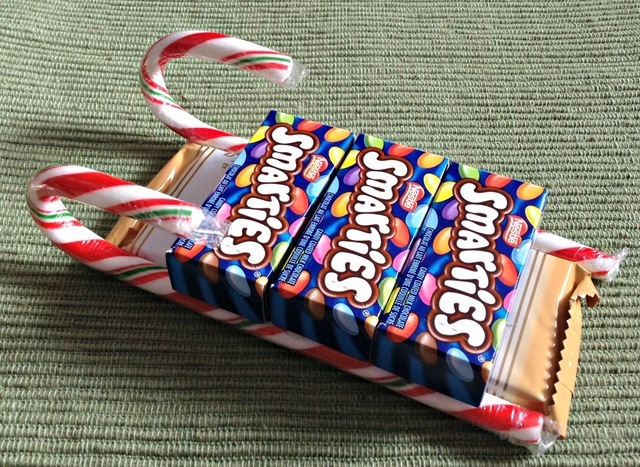 I liked using these boxes of Smarties for this stage of the sleigh because since they’re in boxes, they add stability to the project. Glue on more layers of chocolate bars. A hint I always gave to my students when they made them. 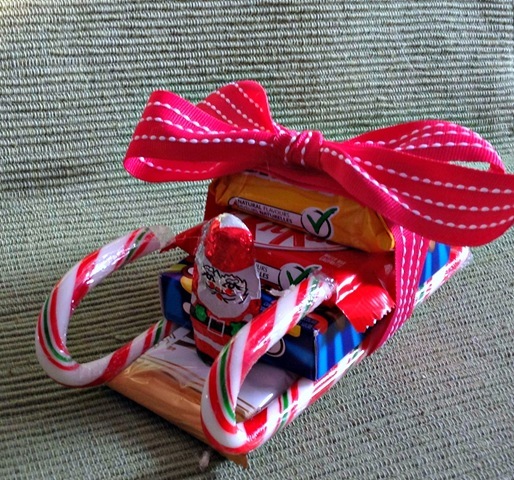 First, make sure to use only wrapped candy – check the wrappers to make sure there aren’t any holes or tears. Then use only a little bit of the glue. Just apply the smallest amount you can to get it to hold so that it’s not seeping out everywhere and possibly into the candy. 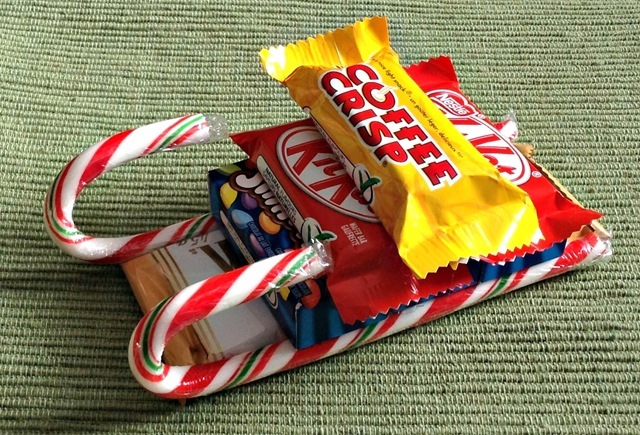 If you follow those tips, the recipient will be able to take the candy sled apart and eat the candy! Final steps are to tie the ribbon around the stack of chocolates – this looks pretty and adds more security to your creation. I like to add a chocolate Santa Claus to the front of the sleigh. Some of my students would even create little ribbon reins for him to hold! That’s it. You are all set to give your gift to your favourite person! Now, since we’re talking about sleighs/sleds, it got me thinking. We might also call this a candy toboggan but I know in some places, people use the word toboggan to mean something else. What do you think the word toboggan means? Be sure to click on the button below to check out all the other great Holiday Craft Lightning ideas!